Why are we not able to find physical traces of the mass graves at Babi Yar? There is no physical evidence in the form of remains in mass graves for the Babi Yar massacre. All that can be found at “the scene of the crime consisted of a few shoes and some rags!” Why don’t we just dig up the mass graves and prove it once and for all? There is eyewitness evidence from after the war that testifies to the existence of mass graves. This evidence is far more substantial than “some shoes and some rags.” Further, the physical traces of the execution of 33,771 Jews at Babi Yar cannot be determined more closely today because the ravine was significantly altered by a natural disaster that changed the geography of the area. There is far more evidence of mass murder at Babi Yar than “a few shoes and some rags.” Yad Vashem has many photographs showing exhumed remains, Jews lying murdered along the route to the execution site, and the Nazis sorting through the heaps of clothing belonging to murdered Jews. Kuznetsov noticed an “angular projection of granite and a seam of coal about a foot thick . . . The coal was brown and crumbly, as though it was a mixture of the ashes from a railway engine and carpenter’s glue.” Young boys, who were tending goats grazing on the slopes, were digging in the seam and breaking up the pieces as they dug them out. Kuznetsov asked what they were doing and they showed him “. . . a handful of something which glittered . . . It was a collection of half-melted gold rings, ear-rings and teeth. They were digging for gold . . . We walked around the place and found many bones, a skull, still not dried out, of someone recently buried, and more pieces of black ash among the grey sand.” According to Kuznetsov testimony, the casual observer, not even armed with a shovel, could find evidence of the massacre at Babi Yar right after the war. As alluded to above, Holocaust deniers complain about the lack of forensic research conducted at Babi Yar. For example, Holocaust denier Herbert Tiedemann has complained that since Babi Yar is such a big part of the “Holocaust story,” why don’t we just dig up the mass graves and prove it once and for all? However, today we cannot find the ash and bone Kuznetsov described—much less the mass graves—because the ravine was completely changed by a massive mudslide in 1961. Today, what remains of Babi Yar relevant to the massacre of the Jews is relatively flat land crisscrossed by roads, bridges, and housing developments; the Dnieper River also now cuts through the most likely locations of the graves. Thus, it is impossible to locate any mass graves and to exhume and examine any remains. 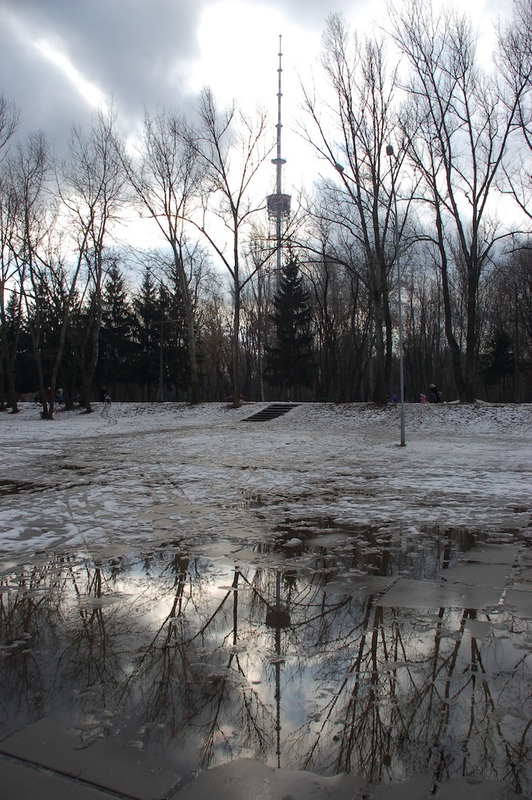 View of the TV tower from Babi Yar, Kiev. By Roland Geider (Ogre) (own work) [Public domain], via Wikimedia Commons. The physical traces of the execution of the Jews at Babi Yar are more than just a photographs of “shoes and rags,” as some deniers claim. To review, the Soviet Extraordinary State Commission located, excavated, and forensically examined several graves, in which they found bodies and burnt bones. Eyewitnesses right after the war confirm the visible existence of bone and ash scattered throughout the southern part of the ravine. After 1961, it became impossible to excavate the killing sites and graves, due to the destruction of Babi Yar after a massive flood. Carlo Mattogno and Jürgen Graf, Treblinka: Extermination Camp or Transit Camp? (Theses & Dissertations Press, 2004), p. 223 at http://vho.org/dl/ENG/t.pdf. Mattogno is referring to an image of scattered shoes and clothing which is part a series of pictures taken or collected by the Soviet Extraordinary State Commission investigating German atrocities in Kiev. You may see these photos at www.yadvashem.org, by choosing “Digital Collections,” “Photo Archive,” “On Line Photo Archive” and entering “Babi Yar” as the search term. The report of the Extraordinary State Commission, “Information of the Extraordinary State Commission on Destruction and Atrocities Perpetrated by the German-Fascist Invaders in the City of Kiev,” is reproduced in full in facsimile at http://forum.axishistory.com/viewtopic.php?t=42076, p. 202. “Evidence by Blöbel on the Burning of Bodies and Obliterating the Traces of Bodies of Jews Killed by the Einsatzgruppen, Affidavit,” NO-3947 in Yitzhak Arad, Israel Gutman, and Abraham Margaliot (editors), Documents of the Holocaust: Selected Sources on the Destruction of the Jews of Germany and Austria, Poland, and the Soviet Union (Eighth Edition) (University of Nebraska Press and Yad Vashem, 1999), pp. 471-473. A. Anatoli (Kuznetsov), Babi Yar: A Document in the Form of a Novel, translated by David Floyd (Farrar, Straus and Giroux, 1970), pp. 16, 17. Kuznetsov wrote Babi Yar under the pseudonym A. Anatoli. Although it was a memoir, calling it a “novel” made it possible for it to be published in the Soviet Union, but even so it was highly censored. Kuznetsov defected to the west in 1968 and died in 1979. As of 1970, Babi Yar has been printed in the west in an uncensored version under his full name, A. Anatoli Kuznetsov. A. Anatoli (Kuznetsov), Babi Yar: A Document in the Form of a Novel, translated by David Floyd (Farrar, Straus and Giroux, 1970), pp. 471-475. You can easily prove this for yourself. Go to http://www.deathcamps.org/occupation/babi%20yar.html. Find the “GoogleEarth Photo” on the left side (about the middle of the page). Right click on the image which shows the same photo with the ex-ravine drawn on the map.